I’m sorry for the lack of posts for the last week: I was out of the city on a family visit in the bosky hills Appalachia. It was wonderful to get out of the city and spend some time on the farm recharging my mental and emotional batteries! One of the highlights of the trip was interacting with my parents’ flock of pilgrim geese–a heritage breed of medium sized geese noted for their mild manners and gender-selected colors: pilgrim ganders are white (with maybe a few dark tail feathers) whereas the female geese are medium gray with white bellies. [A poultry researcher] found numerous references to auto-sexing geese in colonial America, western England and Normandy, France, but the breed was never referred to by a name. 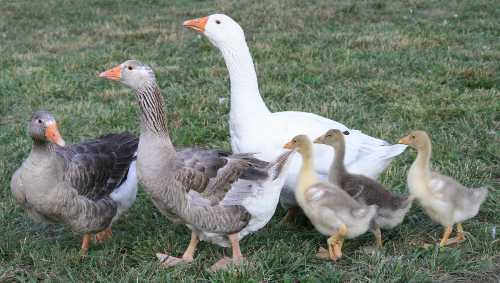 According to some authorities, the Pilgrim goose is related to the now rare West of England goose, another auto-sexing breed, which could possibly have arrived with early colonists…But Oscar Grow, a leading authority on waterfowl in the 1900s, claims to have developed the breed in Iowa, and that his wife named them in memory of their relocation – or pilgrimage – to Missouri during the Great Depression of the 1930s. Authorities agree that the breed was first documented by the name “Pilgrim” in 1935, corresponding with the Grow family’s pilgrimage. The Pilgrim was admitted into the American Poultry Association’s Standard of Perfection in 1939. Pilgrim geese are able to fly short distances and they have a long lifespan (of up to 40 years—not that such an age is particularly old for humans!). They are friendly birds and intelligence shines in their round gray eyes. Goose society is very lively with lots of political squabbling and jockeying for prime mates and nesting sites. 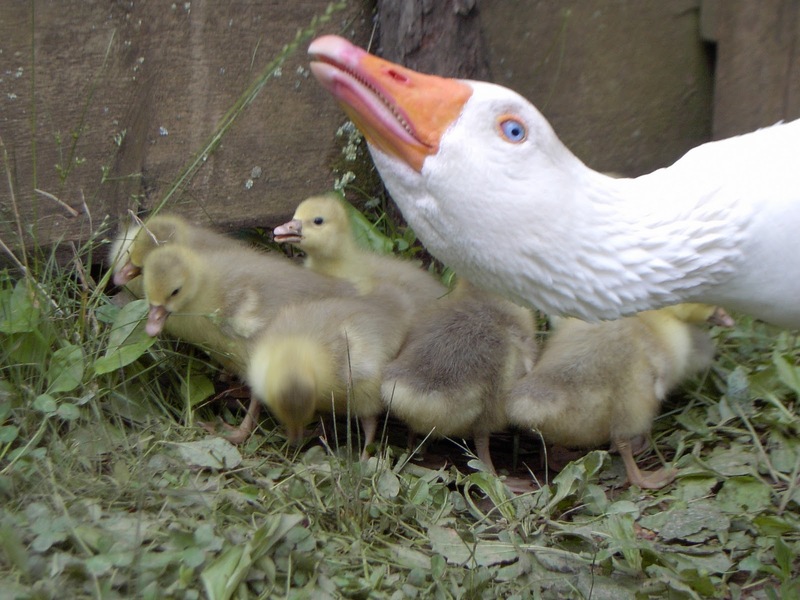 Like other domestic geese they largely subsist on grass and green shoots which they avidly graze with their serrated beaks, but they are hungry, hungry birds and they love special treats. In order to socialize her goose flock, my mother gives the birds some corn and mash in the morning and in the evening. The geese all crowd around the galvanized bin where their food is kept and inquisitively nibble on the pockets of the goose tenders. If the food does not appear rapidly enough they will point their beaks upward toward their human keepers and open them wide hoping perhaps that we might funnel grain directly down their gullet. They are extremely hilarious standing around with their bills open like big feathery ridiculous Venus flytraps! Interesting! 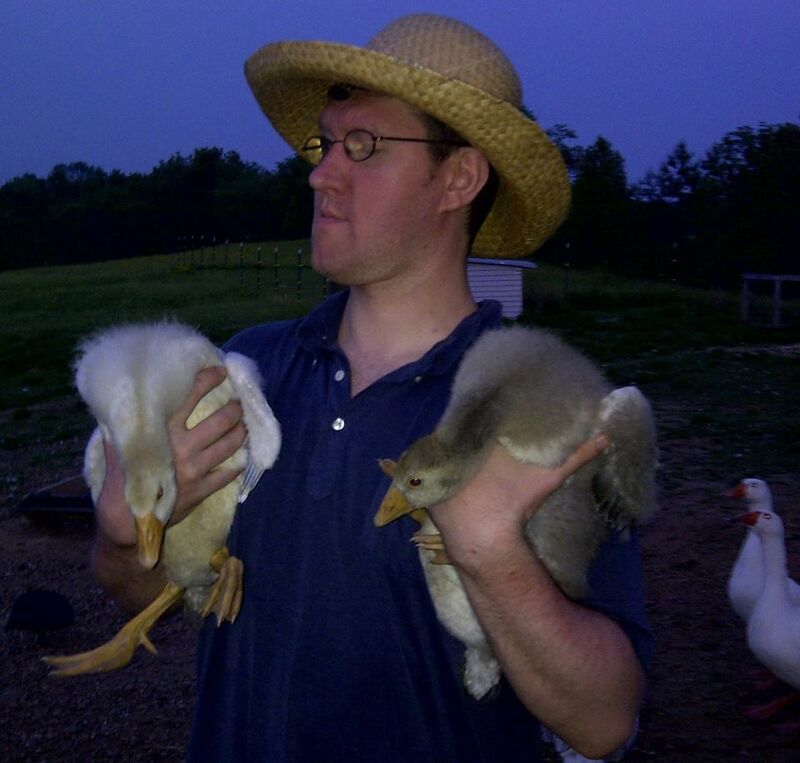 The only domestic geese I’ve had any experience with were quite aggressive…I’m happy to learn there is a more even-tempered variety! I like a relatively peaceful farmyard.